R.I. is very pleased to publish the final essay in Kenny Lake’s series The Specter that Still Haunts: Locating a Revolutionary Class in Contemporary Capitalism-Imperialism. The series was written well before the Donald Trump was elected president of the US. As such, Part IV of the series does not reflect the radical changes in the political sphere that have recently taken place. However, its analysis of who constitutes the proletariat in the US remains accurate, and if anything the vicious attacks on immigrants and attempts to reinvigorate mass incarceration under the current US government make the analysis in Part IV all the more timely. 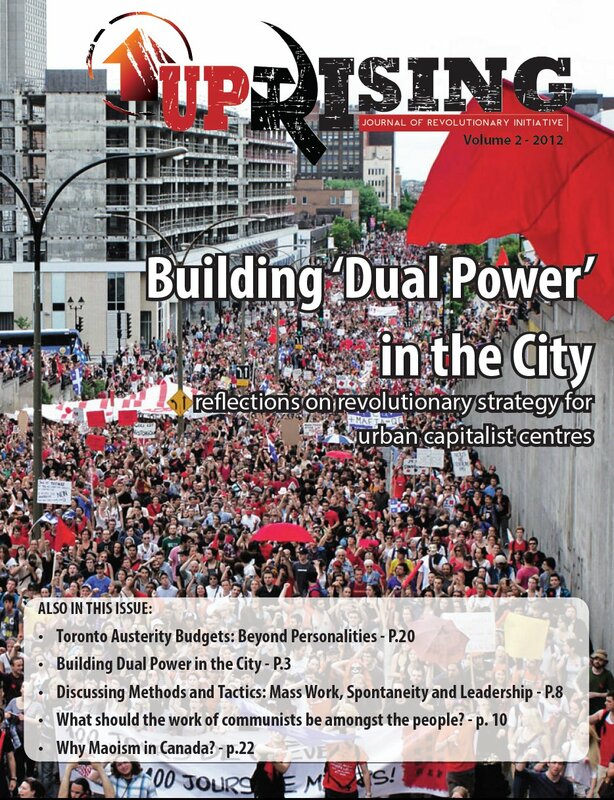 Along with Part III, this essay will appear in Volume #9 of Uprising, coming out… who knows when! When we have something halfway theoretically profound to say. Having laid a theoretical foundation for understanding the proletariat as a concept in part one, drawn a broad outline of changes in the capitalist-imperialist system in part two, and extracted lessons from the successes in forging a revolutionary people in recent communist people’s wars in part three, here we turn our attention to understanding who constitutes the proletariat in the United States and especially its most potentially revolutionary sections. Given the lack of any real communist pole in the US (and in most of the world), it will be crucial for those seeking to build communist organization to do so by picking the ripest fruit for harvesting a revolutionary people. Since, as argued throughout this series, it is in the processes of dispossession and proletarianization and in the social antagonisms created by the anarchic movements of capital that those most prone to revolutionary possibilities can be found, communist practice requires a keen analysis of just who those people are to be most effective. As such, what follows will zero in on the processes that generate such proletarians in the US rather than attempt to make an overarching class analysis of US society. Moreover, many particularities will be left out in favor of identifying broader processes effecting virtually the entire US. Any practical efforts to organize these proletarians in revolutionary struggle will ultimately require delving into how these processes manifest themselves in different geographical locations, as well as dealing with other processes not addressed here. Furthermore, since it would be foolish to discuss concrete methods of organizing in a published essay, strategic and tactical proposals will be kept to a minimum, though much can be implied from the analysis. Finally, the processes of class formation and class antagonisms below have been identified and analyzed in various ways by others, and thus what follows is nothing profoundly new. What is different here is subjecting these processes to class analysis and seeking out the potential they hold for forging a revolutionary people—which even the best of radical petty-bourgeois thinkers will never be capable of. Without taking this statement as absolute, it is fair to say that any communist formation that does not make building roots among our social base its first concern and prime order of practical importance is not on the revolutionary road. 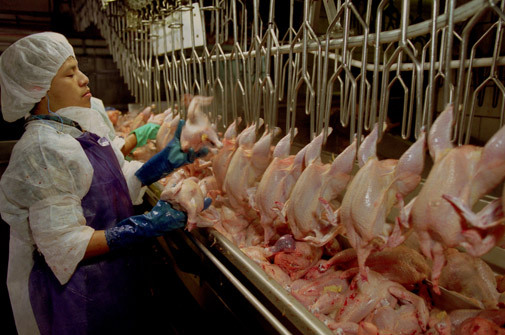 But beginning in the 1970s, Capital no longer needed this population to labor in its factories. With the internationalization of production and the more profitable possibilities for locating production and exploiting the proletariat in the oppressed nations, a wave of deindustrialization swept the US, especially in the industrial cores of the Midwest and Northeast. As sociologist William Julius Wilson summarizes, “in the twenty-year period from 1967 to 1987, Philadelphia lost 64 percent of its manufacturing jobs; Chicago lost 60 percent; New York City, 58 percent; Detroit, 51 percent.”4 The anarchic motion of capital from the old manufacturing belts of the US to the new export processing zones of the oppressed nations thus cohered a new segment of the proletariat in the former: an industrial reserve army of unemployed. Deindustrialization: the Packard Automotive Plant in Detroit. The creation of a permanent surplus population made up especially of Black proletarians in the urban ghettos began exactly at the same time as Jim Crow and the older structures used to maintain the oppression of Black people were coming to end, in large part due to the Civil Rights and Black liberation struggles. As has happened and will continue to happen until proletarian revolution occurs in the US, when the old structures of white supremacy were dismantled, new ones arose to take their place and the majority of white people were enlisted to give their consent and support to these new structures. And it is no coincidence that the new structure—mass incarceration—met the needs both of controlling the new surplus population and providing an officially colorblind form of white supremacy after open racism became more difficult to publicly proclaim following the 1960s. Thus mass incarceration can be understood as both a means for controlling a potentially volatile surplus population and as the leading edge of maintaining white supremacy and the oppression of Black people.12 What makes it occupy such a central role in both regards is its sheer magnitude, the fact that the entire ruling class and its state apparatus has been united behind it as policy and practice, and the way in which the hegemony of the ruling class has been fortified through building consensus with and active participation by white Americans in the mass incarceration of Black people. 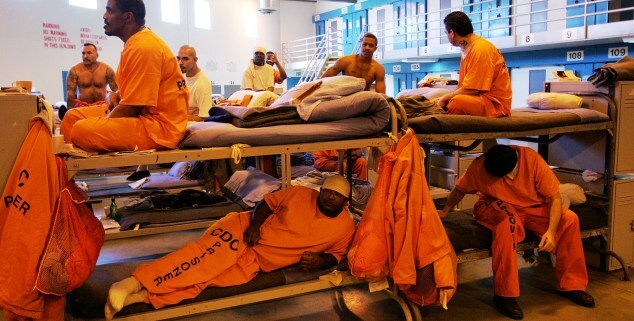 The overcrowded prisons of mass incarceration. Over several decades in which splits and vehement disagreements among the US bourgeoisie have only been growing, its nearly absolute unity on expanding mass incarceration has been striking. This manifested in the electoral battles to prove who was toughest on crime beginning in the late 1960s that reached fever pitch in the 1990s with liberal Democrat Bill Clinton signing off on the execution of a mentally impaired Black man to prove his presidential worthiness. Under the rubric of the War on Drugs initiated by Reagan, each new “tough on crime” law passed through Congress with overwhelming support—the 1988 Anti-Drug Abuse Act, with its 5-year minimum sentences, passed the House of Representatives 346 to 11.15 Clinton’s $30 billion anticrime law, which included handing down life sentences under the “three strikes and you’re out” provision, allocated over $16 billion for “state prisons and the expansion of state and local police forces.”16 The Supreme Court has consistently given its rubber stamp to the practices of the police and court system that corral Black people into prisons, from its consistent rulings eviscerating Fourth Amendment protections against searches and seizures to its blocking of attempts to challenge systematic racism by the justice system.17 Finally, the bourgeois media has given a rather consistent message of support for mass incarceration and the demonization of Black men as a criminal threat. This latter aspect points to the role of mass incarceration in cementing the hegemony of the bourgeoisie through the incorporation of the vast majority of white people as at best passive supporters of imprisoning Black people on a massive scale and at worst as active participants. The public opinion created through the bourgeois media and political sphere constructs passive support, while the 700 thousand prison and jail workers and 2.4 million employees of the justice system18 constitute a direct example of what Gramsci referred to as the subaltern classes brought into the exercise of bourgeois rule. Many of the small towns around prisons depend on those prisons for their economic survival, and thus have a direct material stake in the preservation of mass incarceration. All this dovetailed with an increasing politics of cruelty demonizing Black people and justifying massive cuts to social welfare at the very time when unemployment among ghetto residents soared and the crack epidemic put so many in need of addiction treatment. As Michelle Alexander rightfully emphasizes, mass incarceration not only imposes itself on those who are incarcerated, but on the entire population rendered superfluous to capital accumulation. This includes the numerous control mechanisms imposed on such communities, from probation and parole to consistent police harassment, brutality, and the creation of criminal records so crucial to sustaining mass incarceration. Furthermore, while Black men have been the main targets of mass incarceration, women who are not incarcerated still deal with its effects, having to raise children, find a means of subsistence, and hold families and communities together that are literally separated by prison bars and the distance of prisons located up to hundreds of miles from the communities the prisoners came from. Thus the number of proletarians in a position of direct antagonism with the structure of mass incarceration stretches well beyond the over seven million in prison, on probation, or on parole. What makes this section of the proletariat particularly ripe for becoming part of a revolutionary people? 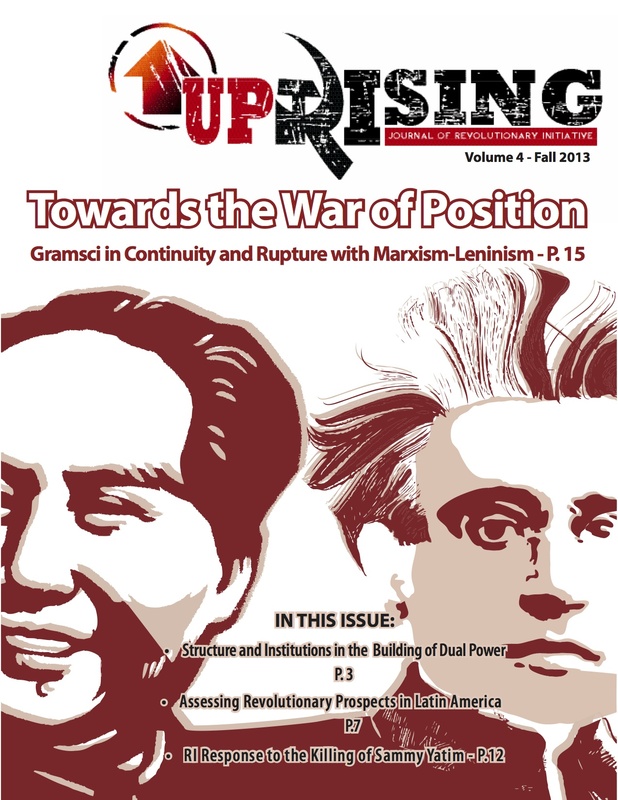 First, as argued throughout this four-part essay, dispossession is not only the foundational act for creating the proletariat as a class, but also heightens the potential for proletarian class-consciousness and revolutionary practice due to its dislocating effects. Since proletarians rendered a surplus population by the effects of deindustrialization have been subjected to a second dispossession—the loss of employment in proletarian jobs—they have a greater stake in and more attraction towards revolutionary solutions. Moreover, they confront the rule of capital not principally through its exploitation of labor, but in its anarchic motions that render whole sections of people superfluous, and thus have an immediate stake not just in ending exploitation but in exercising collective mastery over the socialized means of production. Second, with its dual functioning as social control over a surplus population and as the leading edge of the oppression of Black people, mass incarceration is at the heart of both class antagonisms and the functioning and structure of white supremacy. If the solid core of the necessary broader revolutionary united front is the combination and overlap of the multinational proletariat and the oppressed peoples subjugated by white supremacy, then those affected by mass incarceration embody that solid core. Furthermore, this goes a long way in explaining the sheer brutality and inhumanity of mass incarceration that also makes it an integral site for resistance. Third, mass incarceration imposes collectivity and discipline (see below for what is intended by this term) on those proletarians subjected to it and thus potentially facilitates revolutionary organization. Practically speaking, prisons place a large number of proletarians in a single space and put them in direct antagonism with and, potentially, collective struggle against their immediate oppressors (prison officials, guards, and the white supremacist prison gangs often allied with them). Among the families and communities of the incarcerated, it holds the potential for facilitating collective organization both as survival strategies (such as busses to visit distant prisons) and struggles that do not rely on the structures of bourgeois rule for redress. The potential for the latter is heightened by the fact that those with incarcerated relatives are virtually powerless as individuals to get their relatives released through the court system or other official channels. In regards to discipline, the volatility of a permanent surplus population in the ghettos of the US that often has one foot in criminal activity presents both positive possibilities and difficulties for revolutionary organizing. On the former, this surplus population has been most prone to explosions of rebellious and even revolutionary violence, as has been demonstrated recently from Ferguson to Baltimore. On the latter, the instability of daily life, the fact that life could end any day and thus thinking about any future makes little sense, and the negative ideological impact of crime (see part two) have made bringing this surplus population into revolutionary organization a considerable difficulty. Huey Newton was entirely analytically correct to point to the semi-lumpen youth in the urban ghettos as a social base for revolution, and the Black Panther Party did indeed make considerable headway organizing these youth.19 But times have changed, and the difficulties of organizing this surplus population have increased considerably given the more widespread nature of the criminal economy and the gangster ideology inculcated in those participating in it. Unfortunately the answer of many revolutionaries has been to romanticize the youth among this surplus population rather than find the practical means to organize them, including the need to make ruptures with gangster ideology to proletarian class-consciousness. Mass incarceration has imposed a harsh discipline on this surplus population, and the brutality of such discipline must be opposed and defeated. But communists should not fail to recognize some positive side effects for revolutionary organizing. For example, many prisoners “seek out philosophy” while incarcerated, thus making compelling communist theory and analysis potentially more effective. This discipline can also diminish some of the individualism inculcated in those who did participate in the criminal economy. Furthermore, it forces many to start thinking about the future, albeit generally on more individual terms (such as how to find jobs and take care of children). Such thinking about the future could potentially be transferred to collective revolutionary activities. Here a tactical note is in order. Communist-led initiatives will need to prioritize struggles around those aspects of mass incarceration which curtail political activity and collectivity among the incarcerated. The bourgeoisie is well aware of the potential threat collective political struggle by prisoners poses to its rule, and has thus structured incarceration to limit this possibility. The widespread use of solitary confinement is one salient example, which serves both to break the spirit of those subjected to it and to isolate potential political leaders from the masses. Thus winning some immediate victories through mass struggle that better enable prisoners to organize themselves on the inside, such as ending the use of solitary confinement, would need to be priorities for communists. This will be especially fruitful given that a communist organization worthy of the name will find many of its members going to prison. Recognizing dispossession as a defining feature of the proletariat and valuing the revolutionary potential of surplus populations of unemployed proletarians just as much as working proletarians analytically justifies viewing prisoners, those on the outside under the control of probation or parole, and all those affected by the regime of mass incarceration as a crucial social base for proletarian revolution in the US. That the regime of mass incarceration is both the leading edge of the oppression of Black people today and capital’s main means of controlling the surplus population created by deindustrialization puts those affected by it at the center of the broader revolutionary united front. And given that the surplus population of mostly Black proletarians is put in direct antagonism with the repressive state apparatus, its grievances cannot be redressed short of revolutionary struggle. For all these reasons, this section of the proletariat must be central to the development of a revolutionary people. While deindustrialization meant the loss of manufacturing jobs in the US that had involved much (though not all) of the proletariat up until the 1970s, other and newer processes of capital accumulation required the labor of proletarians, especially those who were amenable to flexible, low-wage, and physically arduous work often lacking in safety standards and who did not have the political rights to challenge their conditions of employment. Key among these processes was the ascendance of finance capital, the emergence of global cities where finance was centered, the rise of the service and tech industries, food production and the ongoing labor required for society’s reproduction, and the construction industry. By the 1970s, sources of internal rural to urban migration within the US (and imperialist countries more generally) had dried up.20 With the US becoming the largest, wealthiest, and most brutal imperialist empire in human history following World War II, the labor aristocracy, bourgeoisified workers, and the petty-bourgeoisie, disproportionately concentrated among white people, came to expect a certain standard of living and distinguished themselves from classes underneath them in part through refusing to carry out certain labor, especially that which was physically intensive and potentially dangerous. The Black liberation struggle, widespread urban rebellions in Black ghettos, and the general refusal of Black proletarians to continue being treated as less than human during the 1960s had the effect of making the bourgeoisie view Black proletarians as an unstable labor force. Thus as capital’s need for easily exploited and politically powerless proletarians increased in recent decades, the US bourgeoisie had to look outside its borders to fulfill its labor needs. Immigrants, and especially undocumented immigrants, proved the perfect proletarians to suit capital’s needs. Given that proletarian immigrants were coming from oppressed nations where life and labor conditions were far worse and they migrated in part to send money back home to families dependent on remittances for survival, they were willing to work in the most back-breaking, dangerous, and precarious positions. This, combined with the lack of political rights and threat of deportation facing undocumented immigrants, meant the bourgeoisie was in a better position to control their labor and subject them to exploitation while denying them the means to resist. Finally, with the structural adjustment programs wreaking havoc on the oppressed nations over the last several decades, there was a growing surplus population abroad seeking out employment wherever capital would provide it (see part two). It is no coincidence that the 1965 Immigration and Nationality Act relaxed restrictions on immigration from Asia, Africa, and Latin America just when capital was beginning to need new sources of cheap labor. Immigrants from Mexico have been the largest portion of the new immigrant proletariat in the US for historical and geographic reasons: the 2,000-mile land border between the two nations; the long history of Mexican migrant farm labor in the US; and the US and Mexico’s deepening economic ties which repeatedly devastated the masses in Mexico, from Mexico’s 1982 economic crisis to the effects of NAFTA. As such, migrant Mexican proletarians will receive the main analytic focus here, though this should not be taken as license to ignore other immigrant proletarian populations in the US when communists get to the hard work of organizing such proletarians in their specific locations. The immigrant proletariat in the global cities thus occupied a variety of positions new and crucial to the functioning of capitalism-imperialism and set an important precedent for the use of immigrant labor within the US. Furthermore, the structural position of Mexican immigrant proletarians and the labor needs of capital brought Mexican migrants to increasingly widespread locations within the US. Two pivotal processes in this regard are the booms and busts of the construction industry and the labor needs of and transformations within food production and agriculture. The building of sports facilities and infrastructure for the 1996 Olympic Games in Atlanta, for example, brought in Latino workers, often undocumented, and goes a long way to explaining the growth in the Latino population in Georgia (which was only 1.7% in 1990) by 300% in the 1990s, with the Atlanta area 7% Latino by 2000.25 Similarly, while much of the Black proletarian population was expelled from New Orleans following Hurricane Katrina in 2005, Mexican and other immigrants were brought in to rebuild the city and then subject to repression and deportation when no longer needed. This immigrant proletariat potentially brings several strengths to the revolutionary struggle. First, given that mobility of the population is one crucial process of the socialization of production, these proletarians exemplify the socialized labor processes that form a crucial basis for moving society through the socialist transition to communism. Furthermore, the migrations they have undergone are part of what makes the proletariat, not just theoretically but also practically in its conditions of life, an international class. The tremendous variety of life, work, and cultural experiences and the personal, collective, and political struggles they have been through all potentially enrich the revolutionary struggle. Second, they are a population that the bourgeoisie has decisively refused to incorporate within its hegemony on multiple levels, from language, culture, political status, to class stratification. Since the bourgeoisie cannot and will not provide solutions to the various forms of oppression these immigrant proletarians face, the necessity for revolution and diverting struggles over these forms of oppression towards revolutionary objectives have far greater attractive power. Consider, for example, the deliberate denial of the ability to unionize in many of the occupations these immigrant proletarians work in. Undocumented status in particular means many are forced to live in the shadows and have developed the skills of living outside the law—an invaluable asset for a communist movement which must be able to operate outside the sight of the repressive state apparatus. Third, this immigrant proletariat faces class antagonisms in a myriad of ways, from its exploitation in the labor process, hazardous conditions in many work sites, its instability of employment due to the anarchic motions of capital, and being harassed, arrested, and deported by the repressive state apparatus. All of these class antagonisms pose the need for collective struggle, with official and legal means to redress grievances often closed off. In places where racist vigilantes, the Border Patrol, and ICE inflict violent terror on immigrants, drastic measures of the Robert F. Williams variety could emerge if this violent terror were to intensify. 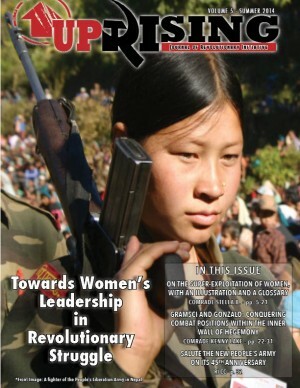 While these struggles around particular manifestations of class antagonisms cannot be the ultimate objectives of a revolutionary people, they can provide crucial training grounds in class struggle and the means for communists to sink roots in, build trust with, and establish organization among immigrant proletarians. Finally, the dispersal of immigrant proletarians in urban and rural areas throughout the US could put the revolutionary struggle in a strategically advantageous position to break out of encirclement and isolation. This is especially important in regards to rural areas which have often been bastions of support for the most reactionary sections of the US bourgeoisie and the most ugly forms of white supremacy—we now have significant numbers of our social base living behind enemy lines. Thus it is incumbent on communist organizing to go beyond the major urban centers and find ways to organize immigrant proletarians within their geographically dispersed locations. Forging this immigrant proletariat into part of a revolutionary people puts several requirements on any organizing efforts by communists. First, it requires not just intensive social investigation but also deeply integrating with the masses in the way Mao advocated, including learning their languages, working the very back-breaking jobs that they do, and living where they live (including rural areas). 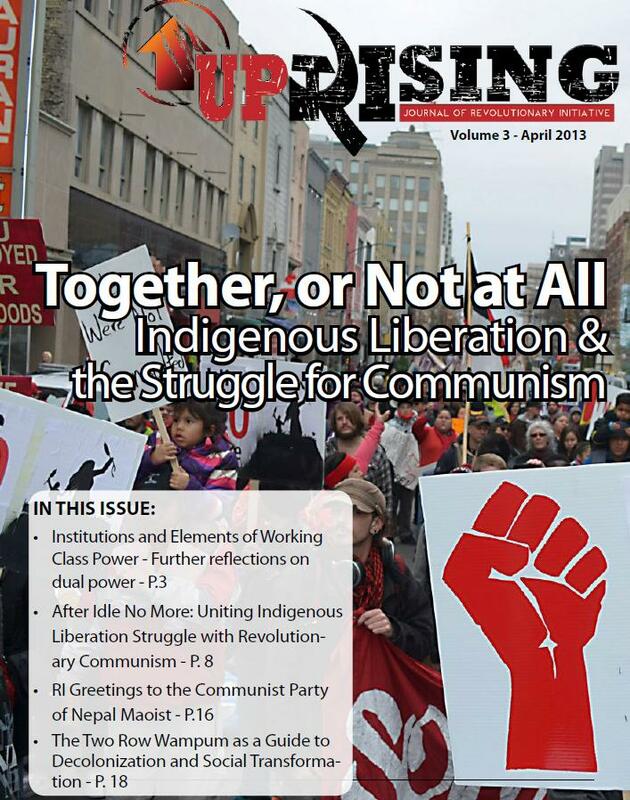 Second, communists will have to be adept at building myriad types of organizations—from radical unions, defense against deportations and vigilante terror, movements around questions of political and cultural rights for immigrants, and quiet organization outside the sight of the repressive state apparatus—in order to bring these immigrant proletarians into the revolutionary struggle. Third, practical bridges will need to be built between these immigrants and other sections of the proletariat both to break out of conditions (and feelings) of isolation and to bring forward the larger interests of the proletariat as an international class rather than the grievances of its particular sections. One last process merits analytic attention given its speed, increasing ubiquity, and importance for class formation and antagonism: the changing social geography in which proletarians, especially Black and other oppressed peoples, are displaced from the inner-cities by the motion of capital and the bourgeois and petty-bourgeois classes following it. Symbiotic with the creation of urban ghettos during the Great Migration was capital flight from the inner-cities and into the suburbs. It was this movement of capital, supported by government policy, which constructed suburban homes and infrastructure while leaving the inner-cities to rot. But in recent decades this motion has reversed for several reasons. First, the restructuring of the economy, with finance, technology, and services overtaking industrial production, has meant that new capital moved into central cities. Second, new bourgeois and petty-bourgeois classes have arisen with this economic restructuring, and many in these classes increasing eschew the suburban dream in favor of trendy urban lifestyles. Third, capital always moves in search of profit, and given that suburban development had reached its apex by the 1970s and land and buildings in the inner-cities had become drastically devalued, it was only natural for capital to eventually re-invest in the inner-cities. Fourth, given that much of the inner-city population has become, to capital, a surplus population, it can be removed without disrupting capital accumulation. 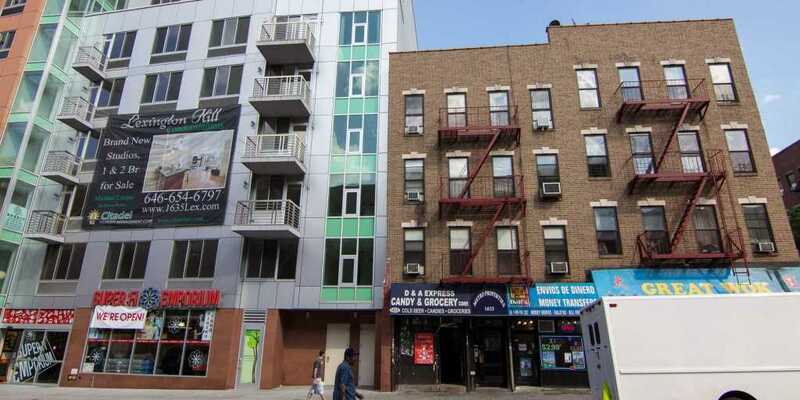 Gentrification in process: new condos for sale in Brooklyn. The new global cities, such as New York and Los Angeles, have been at the forefront of this transformation, and the Giuliani administration of 1990s New York zealously criminalized the homeless and the poor to smooth the transition. In addition, places where ascendant industries, such as technology, are centered have been concentration points for displacement. Writing in 2000, Rebecca Solnit points out that 35% of venture capital and 30% of multimedia / internet enterprises of the US were located in the San Francisco Bay Area. At the same time, San Francisco became the most expensive city to live in nationwide, with rents skyrocketing and evictions along with them—up to seven per day.40 In recent years the tech-job elite has crossed the bay to Oakland and rapidly transformed a former concentration of the multinational proletariat into a hipster haven. 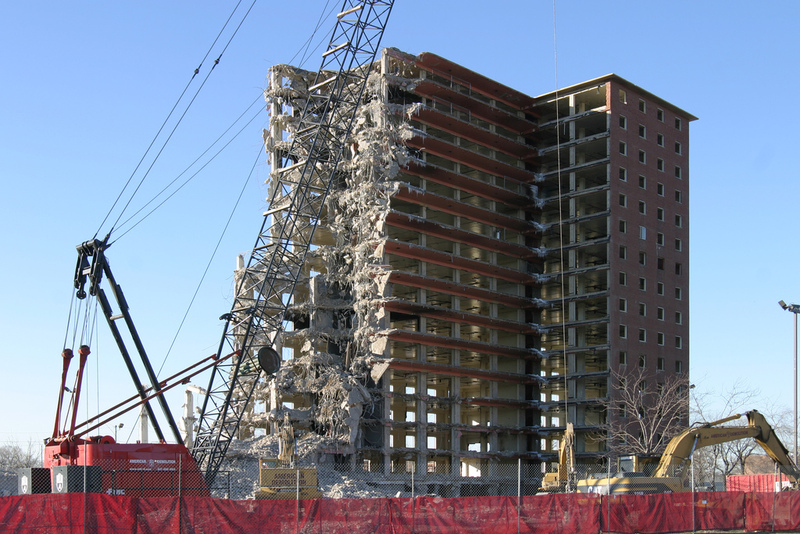 Chicago’s Robert Taylor Housing Projects being demolished. Where high-rise housing projects still exist, they are in the sights of capitalist real estate. New York’s Queensbridge projects, for example, which sits underneath the bridge leading from Queens to Manhattan, is now becoming surrounded by hotels recently transformed to serve the tourism industry. Nowadays when an apartment in Queensbridge goes vacant, the housing authority deliberately leaves it empty in a slow but ominous process of clearing the way for demolition and redevelopment. Short of a powerful struggle against displacement, in a decade or so KRS-1’s battle rap classic “The Bridge Is Over” will likely have a new meaning. As Ehrenhalt argues, gentrification is no longer adequate to describe the vast change in social geography that has spread to most cities to a greater or lesser degree—his term is demographic inversion. The proletariat is being viciously displaced, due to the motion of capital, from its concentration in the inner-cities and dispersed into suburbs and homelessness. The social base for revolution is no longer concentrated in urban centers, but dispersed into clusters spread throughout metropolitan areas.44 That recent site of rebellion against the police murder of Black people—Ferguson, Missouri—is an example of a suburb with a recent increase in Black proletarian residents due to displacement from St. Louis, including as a result of recent airport construction. Such utopian postmodernist petty-bourgeois displacers, many of whom are activists in recent social movements, would thus need to confront not just ideologically but also practically their objective role in a class alignment against the proletariat in order to get on the right side of history. A great weakness among the Maoist organizations that emerged in imperialist countries out of the 1960s has been a failure to develop a concrete analysis of just who the proletariat is in their geographical context. Mao provided an excellent method for undertaking the process of social investigation and class analysis and for breaking with orthodox notions that treated the proletariat as a monolithic subject defined, rather mechanically, by the productive forces it worked on rather than its place within the relations of production. Furthermore, Mao identified the revolutionary potential of other classes, most notably the poor peasantry in the oppressed nations, and the role of other social antagonisms—namely, patriarchy and national oppression—as crucial engines of the revolutionary process. While all this provides a crucial starting point for identifying a revolutionary subject, the concrete application of Mao’s method has not been adequately carried out. Consequently, too often communists have settled for a rather vague conception of “the oppressed” while in fact falling back on outdated and revisionist conceptions of the proletariat. Furthermore, Mao’s mode of analysis is no longer adequate given the dramatic changes in the world imperialist system (see part two). Just as the new communist movement was emerging in the 1960s, the proletariat was dramatically changing in the imperialist countries. Much of the industrial working class had been transformed into a labor aristocracy and the process of deindustrialization was just beginning. Existing communist formations in imperialist countries subsequently failed to recognize how the proletariat was transforming into a permanent reserve army of labor, on the one hand, and proletarianized immigrants who are viciously exploited and denied basic bourgeois political rights, on the other. Alongside this failure of analysis was a failure to integrate with the proletarians undergoing these processes, and thus missed opportunities. For as part three of this series demonstrated, it is within the very processes of dispossession and proletarianization that communists can make the most headway in forging a revolutionary people. It is my hope that this series provides a more rigorous and thoroughly communist approach to seeking out just who constitutes a revolutionary subject capable of carrying out the aims and objectives of communist revolution. Clearly more particular analysis is required, and most importantly, it is time to get down to the hard work of organizing a revolutionary people through a process of deeply integrating with their lives and struggles. Alongside the vague class analysis criticized above has been the wishful thinking that a revolutionary subject will somehow emerge without this type of hard work. To those who are for real about revolution: the specter of communism still haunts somewhere in the distance, but it can and must be given shape and form through our painstaking efforts. 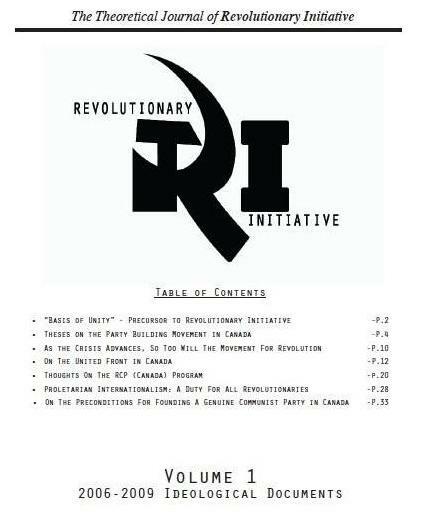 1 Lenin, What Is To Be Done?, in Selected Works vol. 1 (Moscow: Progress Publishers, 1977),158. “Working class” has been changed to “proletariat” to reflect the distinction made in part one, and I believe this terminology to be consistent in spirit with what Lenin wrote. 2 A fuller discussion of the many cultural, social, and other forms that the oppression of Black people takes and how this oppression permeates all class strata among Black people is beyond the scope of this essay. And in order to avoid the analytical question of what constitutes an oppressed nation, in part because the particularities of social formation are more important than the definitions they fit into, the general term oppressed people is used throughout this essay. 3 Löic Wacquant, “The New ‘Peculiar Institution’: On the Prison as Surrogate Ghetto,” Theoretical Criminology 4 no. 3 (2000): 377–89. Also see Karen E. Fields and Barbara J. Fields, Racecraft: The Soul of Inequality in American Life (New York: Verso, 2014), ch. 4 for a historically substantiated argument that the exploitation of Black slave labor served as the foundation for racist ideology in the United States rather than the other way around. 4 William Julius Wilson, When Work Disappears: The World of the New Urban Poor (New York: Vintage Books, 1997), 29–30. 5 Michelle Alexander, The New Jim Crow (New York: The New Press, 2011), 50–51. 6 Wilson, 37–41; Alexander, 51. 7 See Wilson, chapter 5 for a statistical study of employment discrimination. 10 While Black proletarians are the principal element of this surplus population, it includes many other demographics that have resided in urban ghettos for several decades, including Latinos, Native Americans, and some whites. 11 For an excellent discussion of capitalism’s limits on the mobility of labor and surplus populations in particular, see David Harvey, The Limits to Capital (New York: Verso, 2006), 380–85. 12 This analytical framework differs from those which label mass incarceration as the “prison-industrial complex” and thus imply or openly argue that the prime motivation for the increased prison population is to exploit (Black) labor. The error of such analysis is to focus narrowly on the question of exploitation in the labor process as the only or main form that the contradiction between the bourgeoisie and the proletariat takes and to fail to understand how crucial industrial reserve armies—unemployed proletarians—are for capitalism’s functioning. Of course it is also true that private contractors have increasingly used prisons as profit mechanisms, whether through building or running prisons, providing paid services to prisons, or using prison labor, but this is more a matter of joining in to a process already underway. Marx, far from being a narrow reductionist, explained that causes become effects and effects become causes, and it is in this sense that the “prison-industrial complex” adds further fuel to mass incarceration. 13 Alexander, 60, 94, 100, 179. 14 See Alexander, chapter 4, for an exposition of employment and other discrimination against felons. 19 See Joshua Bloom and Waldo Martin, Black against Empire: The History and Politics of the Black Panther Party (Berkeley and Los Angeles: University of California Press, 2013), 66–73 for an exposition of Huey Newton’s analysis of the social position of Black ghetto residents and Black people more generally and their potential for revolutionary struggle. 20 Saskia Sassen, The Mobility of Labor and Capital (Cambridge: Cambridge University Press, 1988), 55–56. 21 This summary of production, reproduction, and the proletariat in the global cities draws from Saskia Sassen, Globalization and its Discontents (New York: The New Press, 1998), 86–91, 111, 121–29, 137–47; and Sassen, Mobility, 22, 145, 157–60, 174, 187. 22 See Douglas Massey, Jorge Durand, and Nolan Malone, Beyond Smoke and Mirrors: Mexican Immigration in the Era of Economic Integration (New York: Russell Sage Foundation, 2002), ch. 3, for a history of Mexican migration to the US over the twentieth century and pp. 34–41 for the Bracero program in particular. 24 See ibid., ch. 5 for an overview of these changes. 25 Alan Ehrenhalt, The Great Inversion and the Future of the American City (New York: Vintage Books, 2013), 91–92. 27 Emilio Parrado and Wiliam Kandel, “New Hispanic Migrant Destinations: A Tale of Two Industries,” in New Faces in New Places: The Changing Geography of American Immigration, ed. Douglas Massey (New York: Russel Sage Foundation, 2008), 104. 28 Douglas Massey, “Conclusion,” in New Faces in New Places: The Changing Geography of American Immigration, ed. Douglas Massey (New York: Russel Sage Foundation, 2008), 344. 29 Guthrey Grieg, “Mexican Places in Southern Spaces: Globalization, Work, and Daily Life in and around the North Georgia Poultry Industry,” in Latino Workers in the Contemporary South, ed. Arthur Murphy, Colleen Blanchard, and Jennifer Hill (Athens, GA: The University of Georgia Press, 2001), 62. 31 Parrado and Kandel, 108–109, 117. 34 Katherine Fennelly, “Prejudice toward Immigrants in the Midwest,” in New Faces in New Places: The Changing Geography of American Immigration, ed. Douglas Massey (New York: Russel Sage Foundation, 2008), 154. 35 Jack Dale, Susan Andreatta, and Elizabeth Freeman, “Language and the Migrant Worker Experience in Rural North Carolina Communities,” in Latino Workers in the Contemporary South, ed. Arthur Murphy, Colleen Blanchard, and Jennifer Hill (Athens, GA: The University of Georgia Press, 2001), 93–94, 100–101. 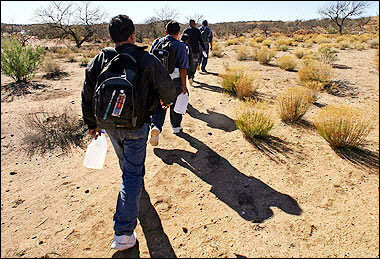 36 See http://data.cmsny.org/ for statistical estimates of undocumented immigrants. 37 Douglas Massey, “Conclusion,” in New Faces in New Places: The Changing Geography of American Immigration, ed. Douglas Massey (New York: Russel Sage Foundation, 2008), 246–48. 38 See Noel Ignatiev, How the Irish became White (New York: Routledge, 1995) for an excellent explanation of how Irish immigrants went from being “white niggers” largely confined to the worst of proletarian positions to being integrated into the oppressor white nation. It is worth noting that tensions around upward mobility among the children of immigrants will continue to give rise to political struggles, as recent and often quite radical political activity by undocumented immigrant college students (“Dreamers”) indicates. Whether these political struggles result in the bourgeoisie offering immigrants in these positions partial incorporation into the petty-bourgeoisie and the exercise of bourgeois hegemony or whether such struggles deepen their critique of US society and refuse to separate themselves from the predicament of the immigrant proletariat remains to be seen. 39 Neil Smith, The New Urban Frontier: Gentrification and the Revanchist City (London and New Rork: Routledge, 1996), 18–26. 40 Rebecca Solnit, Hollow City: The Siege of San Francisco and the Crisis of American Urbanism (New York: Verso Press, 2000), 14–15.